Encouraging every person to experience ultimate victory through Christ- centered living everyday. 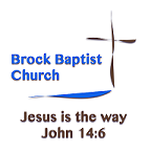 At Brock Baptist Church, God is the focus and center of our activities and ministries. We have a deep desire to seek God's will, and fulfill His call to serve, witness, share His love, and minister to the spiritual needs of one another. Our services and messages are Bible and scripture-focused, and we believe and teach that as the foundation for daily living. We invite you to join us as we worship and serve our Lord, Jesus Christ!! SUNDAYS @ 9:30 AM "Out of Egypt"
We are studying "The Gospel Project", an in-depth chronological study of the Bible, guiding us to the "Christ Connection" in all scripture. Bible Fellowship (also know as Sunday School) is a great opportunity for small groups to learn, discuss, interact, and develop relationships with one another. We study the same curriculum church-wide, which creates opportunities for family discussion time during the week. We invite you to join our church family as we "grow" together.